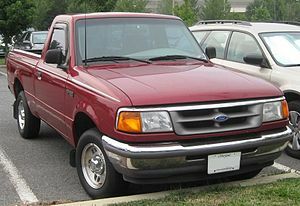 My husband has been driving the same miniature pickup–stick shift, no CD player, no airbags–as long as I’ve known him. We spent our first date, on a November night that sparkled with frost, driving around talking in the darkness of the warm cab. These days, Alex rides shotgun in that cab more than I do. There’s something almost magical about that arrangement–side by side, not chauffer-to-passenger–that facilitates real conversation. I’ve frequently envied Christian the chance to connect with Alex that way en route to school–the chance to listen, and teach, and otherwise get to know the boy my baby is becoming. I’m sure when The Santa Claus Discussion finally comes, it too will take place in the truck. Last week, when Christian was off work, I got to sit in on Alex’s piano lesson and bring him home without any tiny tagalongs–in other words, in the truck. In the wake of the Peach Pit Lady Incident, it was clear we were facing a teachable moment. The man who had the peach pit thrown at him was asking for diapers–a request that cut me to the quick the first time I saw it, weeks ago, whose persistence has begun to make me a bit suspicious. We talked about mental illness and extremely poor choices. We talked about alcohol and drug abuse, and how many people think you should give money to shelters instead of to the homeless, because we can’t be sure they’ll use it to help themselves–that they might use it to hurt themselves worse. We talked about the different options homeless people have for shelter and food, and how most of them have rules about drugs and alcohol, so sometimes the people don’t want to (or can’t) go there. We talked about the shelter our family has supported, the one we went to last week, which takes care of “the ones nobody else wants,” as my pastor once said. And then, as if that wasn’t deep enough, the conversation moved to the reason we care at all. I told him the story about the sheep and the goats, from Matthew 25. When Jesus said, “What you did not do for one of these least ones, you did not do for me,” he was making it clear that whenever we see a person in trouble–no matter how bad their choices have been–we’re looking at him. That’s why I’ve been trying to keep a few $1 bills in my wallet, I told Alex. I can’t just drive by and pretend I don’t see them. Because let’s face it, people, that’s what we do. It’s an ugly truth, unpleasant to face, but there it is. We don’t even meet their eyes, because doing so invites connection; if we’re not going to give them anything, we don’t want them to develop expectations. But money or provisions given to shelters doesn’t fulfill the obligation to acknowledge the face of Christ, person to person. By this time we were headed up the ramp at our exit, and I knew it was time to stop talking. There’s definitely such a thing as overkill. We were quiet most of the rest of the way home; I could practically hear his brain turning everything he’d heard around and around, shaping and filing it. What he’ll do with it…that remains for another conversation in the truck. Kathleen, I need to ride beside you in that truck. Maybe that’s what I just did. One day for Alex, childhood will be a distant memory with many forgotten conversations, but the man he will be will have been fashioned from the stuff of it. Keep listening and talking. I know I hear you. Kathleen, I need to sit next to you in that truck. Maybe that is what I just did. One day childhood will be a distant memory for Alex, but the man he will have become, will have been forged in the stuff of it. Keep listening and talking. I know I hear you. The two posts above are both mine. I was helping her ( (Sr. La Donna Pinkelman, AKA “San Damiano”) with re-posting on her site, and still signed in…too confusing!